I’ve been thinking a lot about habits recently. I’m not much of a New-Year’s-resolution-maker, but I do find great value in establishing good habits and dropping unprofitable ones–not just in January, but at any time of year. One habit that seems to prop up just about everything else in my sparkling-vintage life is a good, old-fashioned night’s sleep. With sufficient sleep, I’m calm, optimistic, pleasant, and productive. Without it, I’m . . . well, none of those things, with a decided lack of sparkle besides. To mangle Shakespeare, let’s just say that without proper sleep, my sleeve of care unravels at warp speed. 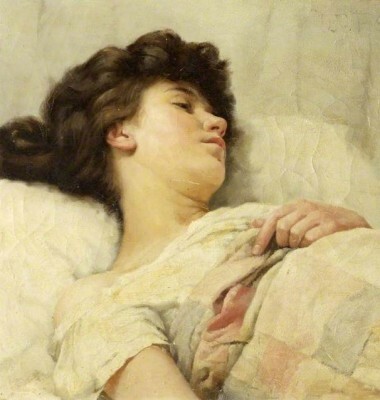 In many ways, our ancestors had an easier time of sleeping than we do. Before Mr. Edison unleashed his electrical genius on the world, nighttime meant darkness, and darkness meant sleep. Today, just because the world keeps going 24/7/365 doesn’t mean that we should. Our circadian rhythms benefit from cues like darkness and quiet to help us get the rest we need. A lack of television, computers, and other electronic screens in the olden days was also a boon for sleep. Today our addiction to wireless devices keeps us wired way too far into the night. *Go to bed in a dark, quiet bedroom. Use a sleep mask if it’s impossible to eliminate all light, and ear plugs if a noisy environment keeps the sandman at bay. *Develop a nighttime routine to help you settle down and to signal the brain that you’re heading for bed. The specifics are up to you—maybe choose tomorrow’s clothes, wash your face, brush your teeth, smooth on some hand cream, change into sleepwear, read, pray, and do some light stretching exercises. Nothing too strenuous. *Speaking of sleepwear, do you have something decent to wear to bed? Throwing on any old tee-shirt and sweatpants, while comfy, is not very Sparkling Vintage. And don’t tell me it doesnt matter if “no one sees.” YOU see, and so does your spouse if you’re married, and any housemates you might have. So treat yourself to a pretty nightgown or pajamas in natural fabrics for a comfortable night’s sleep. I like cozy flannel in the winter and crisp cotton in the summer. Some of you slinkier types might appreciate silk. Beware of one-hundred-percent synthetics if you tend to be too warm, too cold, or of an age when you’re prone to hot flashes. *Did you know that lavender is conducive to sleep? Pour a little lavender oil in a warm bath at bedtime, or put a few drops on a cotton ball and slip it inside your pillowcase. *Warm milk and chamomile tea are time-honored remedies for wakefulness. Just don’t drink a lot too close to bedtime–you don’t want your slumber to be disturbed by frequent trips to the bathroom. Avoid heavy meals and caffeine late in the day. *Turn off the TV and other electronic screens at least an hour before bed. The evening news report is not likely to help you relax, anyway. Read, talk with your loved ones, or cuddle up instead.